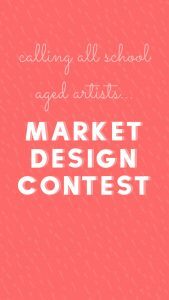 We decided to host an art contest this year so you can help us create designs for our poster art that will be displayed around town for all to see! Art entries should portray the Rexburg Farmers Market and/or product(s) of the market. The contest starts now and entries must be received by April 15 at 5:00 pm. You may submit your entry via direct mail (through the post office) or email, but make sure the entry form accompanies your entry. Our very own market board of directors will judge the entries for the art contest. This art contest is open to all Public, Private and Home Schools within Madison, South Fremont and Sugar Salem School Districts. Grades 5-8 and 9-12 will be two separate divisions for judging and each division’s winners will receive cash prizes. Most importantly, add the entry form to your art work and thoroughly read the rules for submitting your art. Best wishes! We can’t wait to see your art entry. To learn more about our vendors and what products the market will be offering this year, click the link below and research away! Also, more is not always better. Sometimes, it is just more.